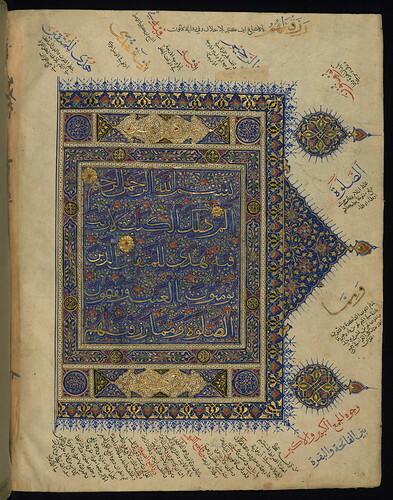 Illuminated Manuscript, Koran, Incipit, Walters Art Museum, Ms W.563, fol. 9b, originally uploaded by Walters Art Museum Illuminated Manuscripts. This large-format, illuminated Timurid copy of the Qur’an is believed to have been produced in Northern India in the ninth century AH / fifteenth CE. The manuscript opens with a series of illuminated frontispieces. The main text is written in a large vocalized polychrome muḥaqqaq script. Marginal explanations of the readings of particular words and phrases are in thuluth and naskh scripts, and there is interlinear Persian translation in red naskh script. The fore-edge flap of the gold-tooled, brown leather binding is inscribed with verses 77 through 80 from Chapter 56 (Sūrat al-wāqiʿah). The seal of Sultan Bayezid II (1481-1512 CE) appears on fol. 8a. There is an erased bequest (waqf) statement and stamp of Sultan ʿUthmān Khān (1027-31 CE) on fol. 3a. good Mobdro has actually not released main variation of https://mobdroapp.meta.watch of Mobdro utilizing internet browser application nice.